Use this coupon code today for free shipping on any order from The Art of Shaving. Shop sale at The Art of Shaving for up to 50% off popular products. Get $20 off 5oz Shaving Cream with Purchase of 30ml Cologne from The Art of Shaving. Sign up today for replenishment with The Art of Shaving to save 20% Off Select Blades. 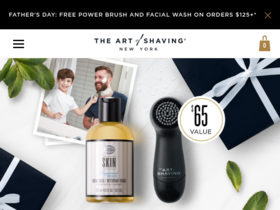 Check out The Art of Shaving online for their latest special offers.